After a chaotic week 3 filled with upsets, there’s a new No. 1 in the AVCA poll and two new teams in the Top 5. 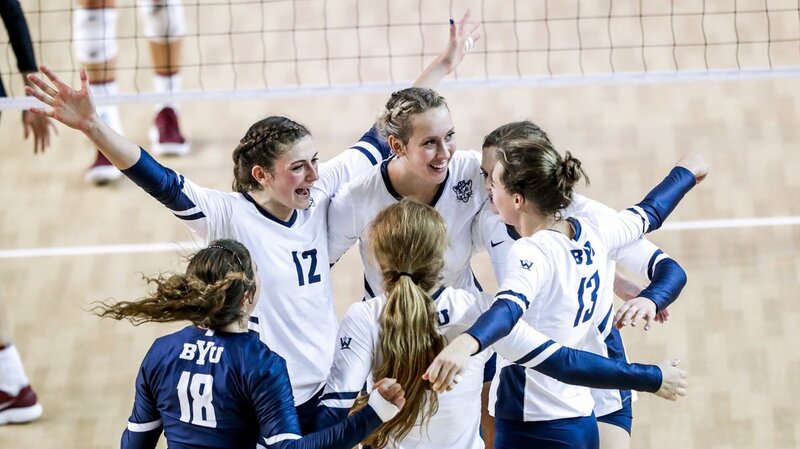 BYU, one of three undefeated teams among the Top 10, climbed two spot from No. 3 to No. 1 after a 3-0 weekend at the Marquette Invitational. The Cougars swept No. 10 USC and topped No. 25 Marquette in four sets in the finale to stay perfect at 8-0. BYU earned 54 of the 64 first place votes, while No. 2 Stanford picked up the other 10. The Cardinal also moved up two spot this week from No. 4 after a solid outing including a sweep of No. 5 Penn State and then No. 1 Minnesota in four at the Big Ten/Pac-12 Challenge. Texas vaulted into the Top 5, jumping from No. 6 to No. 3 with wins over Texas State and No. 16 Kentucky. Nebraska rejoined the Top 5 at No. 4, up three spots from No. 7 with a five-set road win over No. 14 Creighton on Thursday and a sweep of Iowa State on Sunday. After two coaches left Nebraska off their ballots last week, both have included the Huskers this week: one ranking them at No. 6 and the other at No. 8. The points earned from those two rankings were enough to bump the Huskers an extra spot ahead of Penn State in the Week 3 rankings. Despite its loss to Stanford, Penn State remained at No. 5, closing out the weekend with a win over then-No. 18 Oregon. Last week’s No. 1 Minnesota fell to No. 7 and No. 2 Wisconsin dropped to No. 6. The Golden Gophers lost to both Stanford and Oregon at the Big Ten/Pac-12 Challenge, while the Badgers fell to then No. 15 Baylor. The biggest climbers of the week were Oregon, which jumped six spots from 18 to 12, and Cal Poly, which vaulted eight places from No. 22 to 14. Other big movers included Illinois (up to No. 8 from No. 11), Pittsburgh (up to No. 9 from No. 13), Creighton (up to No. 10 to No. 14), Purdue (up to No. 15 from No. 19), and Marquette (up to No. 21 from No. 25). Alabama made its way into the rankings at No. 25 after topping Marshall, Georgia Tech and Northern Illinois to move to 9-0. The poll position marked the first ever national ranking for the Crimson Tide in program history. Teams on the descent were Florida, USC, UCLA and San Diego. The Gators fell three spots from eight to 11 with a five-set loss to Northern Arizona. The Trojans dropped from 10 into a tie for 16th after falling to BYU and Marquette before rebounding with a five-set win over Syracuse to close out the Marquette Invitational. The Bruins dropped four-set road matches to Cal Poly on Thursday and Friday. The Toreros plummeted seven spots, from 16 to 23 after splitting matches with Tennessee. Four teams mentioned on only one ballot for a total of 10 combined points.